Macy’s worker Susan Hedman keeps a notebook of all her schedule changes so she can hold Macy’s accountable to Seattle’s secure scheduling law. Susan Hedman knows her rights under Seattle's secure scheduling law. She's supposed to get paid extra every time her employer, Macy's, cuts a shift from her schedule fewer than two weeks out. But that "premium pay," as it's known to those covered by the law, doesn't always end up in her paycheck. 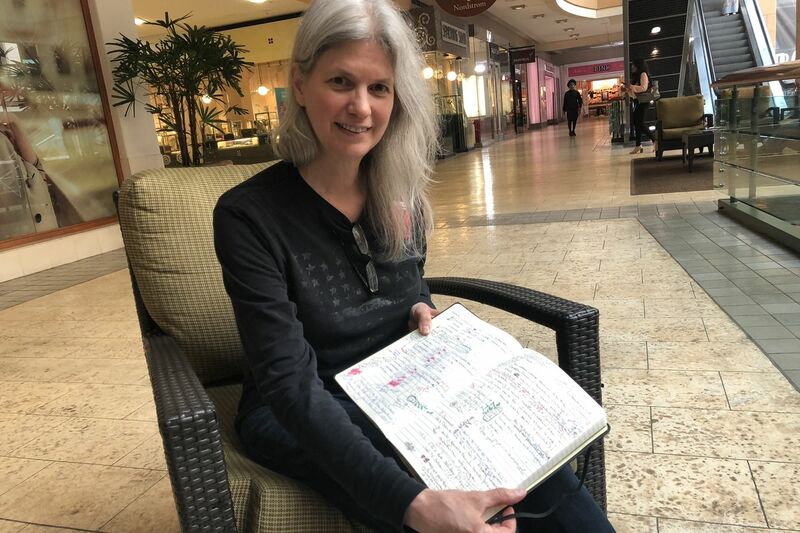 So, Hedman, 60, a merchandise specialist who has worked at the department store for more than 30 years, keeps detailed notes in a black leather notebook. She takes it up with her manager and Macy's administrative support team. She helps her coworkers — all members of union UFCW Local 21 — do the same. And they don't stop until they get the money they're owed. "You have to keep after them," she said in an interview in August. "It's frustrating. It's like a second job." Macy's did not return a request for comment. Hedman, though, is grateful for the law. Her union contract originally said she would receive her schedule 10 days in advance, but the law requires that she now get two weeks' notice. Two weeks, she said, to plan her life. To make an appointment at the vet for her sick cat, to organize a visit to see her parents. But the law also has had unintended consequences. The city is backlogged with complaints, so she'd prefer to resolve the issue herself. And her situation is a best-case scenario: Not every worker feels empowered to confront an employer for money owed. As Philadelphia's City Council prepares to host a hearing Oct. 30 about its own version of Seattle's year-old "secure-scheduling law," known here and around the country as "fair-workweek" laws, here's a look at what the city can learn from Seattle, thought to be a national leader in worker laws that aim to combat poverty. The city would have to put resources into enforcement and education — and quickly, if it wants the law to be more than symbolic. Enforcement often takes a backseat after the initial sprint and fanfare of getting a law passed. In past years, Seattle has suffered from the same issue. But in fall 2016, when Seattle passed its secure-scheduling law, the city also approved funding to double the size of its workplace law enforcement arm, the Office of Labor Standards (OLS). Resources for enforcement and education are of the utmost importance when it comes to the effectiveness of workplace laws, said OLS policy manager Karina Bull. Timing is crucial, too: If you wait too long to start enforcing a law, "the rap gets around" that the rules can be broken, said Tom Geiger, spokesperson for retail and food workers union UFCW Local 21. Karina Bull, policy manager for Seattle’s Office of Labor Standards, said resources for enforcement and education are crucial. OLS, which enforces six other laws along with secure scheduling, now employs 23 and has a budget of $5.7 million. A whopping 40 percent of that budget goes toward education and community outreach, largely in the form of contracts to community organizations and worker centers who already have a base of members, because the law can't be effective if workers don't know it exists. Allocating funds to community organizations is also an acknowledgment that not everyone feels comfortable going to the government, which is often the case for the most vulnerable workers, the ones who Bull says are her office's top priority to protect. Even with those resources, OLS is still swamped. Of the nearly 150 total investigations the OLS team has worked on this year, eight secure-scheduling investigations are still open, 10 are on the wait-list, and five are complete, including one with Gap, which resulted in the company paying more than $20,000 to workers, and Elephant & Castle, which had to pay nearly $123,000 in penalties and unpaid wages for secure scheduling and a number of other violations. The office aims to complete investigations in 180 days but it doesn't always. Yes, the law has the ability to improve workers’ lives, but it could make their lives more difficult, too. Employees could end up working an understaffed shift if coworkers call out and an employer doesn't think it's worth it to pay the "premium pay" penalty to fill the shift. It's an issue members have complained about, said John Engber, director of the Retail Coalition of Seattle. A drugstore, for example, would deem it necessary to pay premium pay when a pharmacist calls out but maybe not a cashier. That could lead to more employee burnout and turnover, as well as longer lines at the registers, all of which ultimately hurt a company's bottom line. But confusion about the law is common. The law actually allows an employer to fill shifts without penalty if it's because another employee called out — as opposed to, say, an underestimation of demand — and the employer offers the shifts through mass communication such as emails or texts. According to data from OLS, the office fielded 572 inquiries from employers and employees about secure scheduling in 2017, the year it went into effect. We would have more to gain and more to lose. But the stakes are higher here. Philadelphia is the poorest big city in the United States, while one in four Seattle families reported a yearly income of more than $200,000, making it among the few American cities with such high earners. The median household income in the Seattle, Bellevue, and Tacoma area is more than $78,000, while Philadelphia's is just over $41,000. At 1.5 million people, Philadelphia is more than twice the size of Seattle. And the tech industry has boomed in Seattle, home to major corporations such as Amazon, Microsoft, Facebook, and Google, while Philadelphia is still struggling with job growth. Thus, although Seattle offers lessons, Philadelphia has to translate how the law would best work here.